Absolutely Deserve to Buy ? Solar energy-No need any electricity, save your money in pocket and energy from natural, charged by sunlight for 4 to 6 hours can provide 6 to 8 hours illumination, realizing energy saving. Sophisticated technology-Finishing with durable stainless steel,no worries about raining and snowing ,the light can work normally under all kinds of weather with the waterproof rating of IP44 and weatherproof. Convenient to use-Turn on the switch,then pull out the bottom spike, install it and insert the light into the soft earth,simple like toy assembly.The solar path lights automatically turn on at night and turn off at dawn. 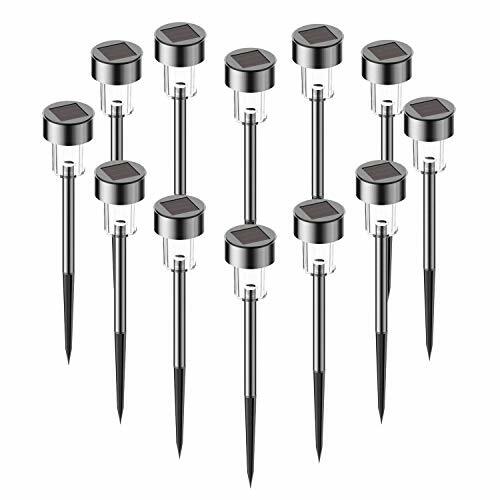 Decorate your own way-Suitable for outdoor way, warm white LED light help you to decorate patio, garden, porch, yard paths and walkways,illuminate the way for you to home after working late at night. FC-Fancier LABEL ADDED and WARRANTY: 100% Guaranteed Product Satisfaction, 30 Days No Hassle Money Back and 1 Year Warranty. For you a 100% money back guarantee in case our Product does not live up to your expectations to make it an absolutely risk-free purchase. If you have any problem, please email us freely. If you have any questions about this product by FC-Fancier, contact us by completing and submitting the form below. If you are looking for a specif part number, please include it with your message.